A couple of years ago (longer?) 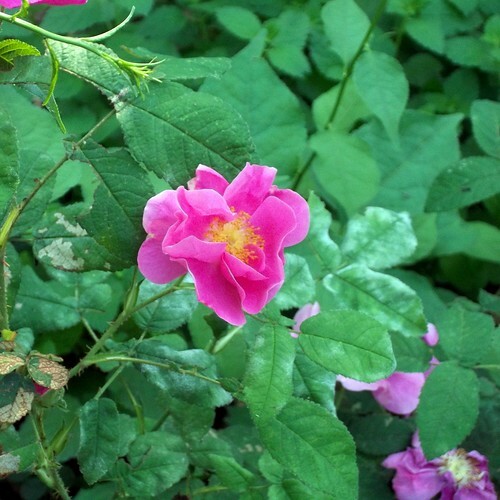 I started on a post or two about one of my favourite roses, the Rosa Mundi (Rosa gallica versicolor), touching on history of the variety and origins of the name, and all that sort of thing. It turned into a thicket. I have a three-page document of sentence fragments and notes to go look things up stored in my Google Docs, and every time I try to resolve one question, three more present themselves. What I really need is two weeks in a good academic library with no other things to think about, and that ... is not likely to happen this year. But the rose is blooming again and looking rather lovely. Speaking of thickets, it's the habit of R. gallica, when grown on its own roots, to sucker and spread. When I bought my Rosa Mundi, it was a single cane in a nurseryman's tube. It now occupies several square feet of my front yard, and one section has reverted to the solid red Apothecary's Rose (R. gallica officinalis). There's been some debate and some research on whether striping in roses is caused by a virus, in the same way that the Tulip Breaking Virus causes stripes and streaks on tulips. 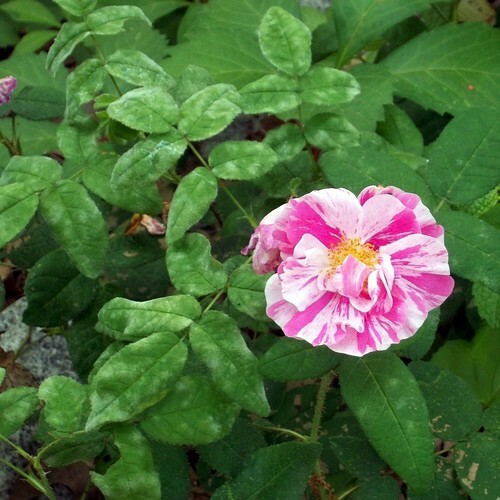 The answer seems to be maybe, at least some of the time, but in Rosa Mundi the stripes seem to be the result of a apontaneous mutation (a 'sport') rather than a virus. Other gardeners report that they often get a solid red blossom on an otherwise striped bush; I don't know how common it is for several canes to revert to red. I am thinking about oh-so-gently digging out the solid red section and relocating it.